Take control of your dental health. From natural-looking white fillings, root canals & extractions, to whitening, smile-design, bonding & veneers, Fourways Dental Clinic has affordable options for all types of dental treatments. Contact us today to see how our experts can help you smile again! At Fourways Dental Clinic we don't rush emergency patients out of the door as soon as they arrive. We like to take our time getting to understand the root cause of your aches & pains so we can provide the best treatment options for you. We don't like to dictate your treatment to you, so we like to discuss all suitable options and give you a printed estimate before you decide to book in for treatment. No matter how embarrassed or afraid you might be, our friendly team of dentists & specialists are dedicated to helping you smile again. With consultations starting from as little as £25 and most patients seen in the same week by our professional & friendly team, there is no reason to be afraid of visiting the dentist again. Losing a tooth can be a traumatic experience. Many of the patients in these photos presented to us with bulky plastic NHS dentures to fill the gaps in their smile. They were unable to wear the appliances and tended to use them only when leaving home. After discussing all of the available options with our expert dentists, many decide to either place dental implants, fixed bridgework or minimal preparation bonded-bridges to replace the dentures and missing teeth. In just 2 appointments smiles can be back to their beaming best! Though some still require full mouth makeovers, for many people dentistry has moved on from the days of drilling and filling to repair damage. Now we can take even the healthiest smiles and transform them to selfie-loving perfection with minimal damage to the underlying teeth. Whitening followed by bespoke composite bonding. No drilling. No injections. No damage to precious underlying enamel. Some patients present to us wanting a perfect smile but with less than perfect teeth already in place. In these cases composite bonding is not enough to achieve the desired sizes & proportions of teeth to give a perfect smile. Here, this young lady presented to us with a gummy-smile, short teeth & three failing incisors. Veneers alone would've left her teeth looking too long for her mouth with too much gum on show. We undertook a gum lift & replaced the troublesome teeth with implants, then restored her smile with minimal prepartion porcelain veneers. A life changing result for a beautiful patient. Silver mercury-based fillings are becoming a thing of the past. They can leave teeth looking dull & grey while leaving them susceptible to severe sensitivity due to cracks. At Fourways we pride ourselves on being able to restore even the biggest cavities back to full health using life-like white composite restorations, artistically hand-crafted by our expert dentists. Nobody would feel like smiling if they'd had a dark front tooth for 15 years. Some of these young patients presented to us with dark restorations on already discoloured front teeth and were visibly ashamed to smile for photos. After talking through all the different options we often find the best result (with no damage to underlying tooth) would be to bleach the dark teeth internally, followed by a course of Philips® Zoom! whitening for the rest. If necessary, once whitening is complete we have new veneers or crowns made by our master ceramist to match the adjacent teeth to give that perfect grin. Gaps. Buck-teeth. Spaces. Some believe they are lucky. Some feel they bring character to a smile. Others are embarrased to smile because of them. At Fourways we do not judge, and if you are happy with them, we'll happily leave them alone. 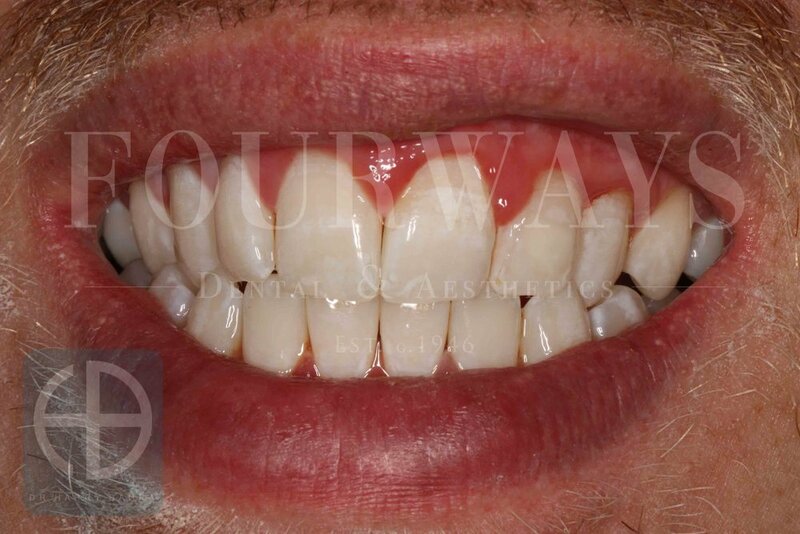 However many patients often dislike having visible gaps in their smile. The best thing is that we can close the spaces in just one appointment using composite bonding, with no drilling or damage to your natural teeth. These photos illustrate just a handful of our favourite cases. Life-changing results for our lovely patients. Smiles can occasionally be spoiled by the odd light or dark patches of front teeth. Sometimes this is just due to the way those teeth developed, other times its due to damage when they were still growing, and often it's just due to early decay - especially if oral hygiene is poor during orthodontic treatment. Thankfully dentistry has moved beyond excessively cutting away tooth tissue and consigning patients to a lifetime of damaging restorations. 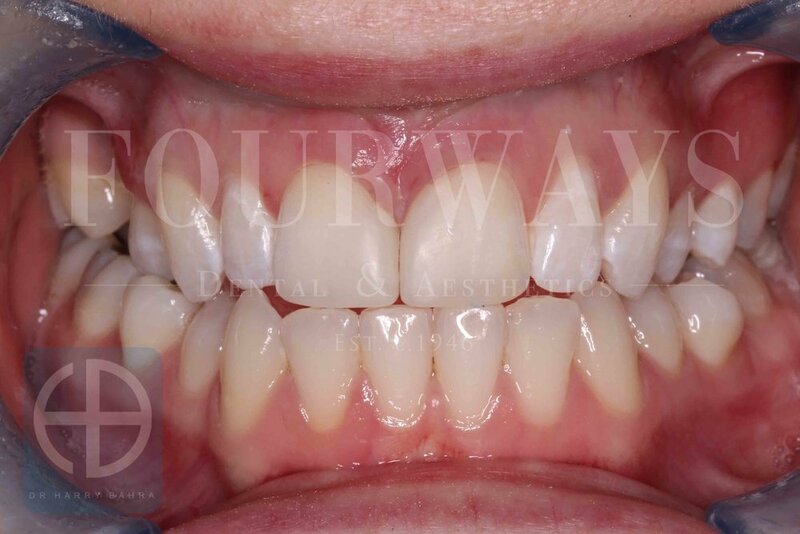 At Fourways we are at the forefront of minimally-invasive dentistry and can often treat discoloured patches with just some simple whitening & composite bonding. In some cases we can even use non-invasive treatments such as ICON resin-infiltration to treat milder cases with absoulutely ZERO drilling or injections.